As Nigel Slater says: "there is something deeply satisfying about taking a huge, golden tart to the table, a tart we have made ourselves. 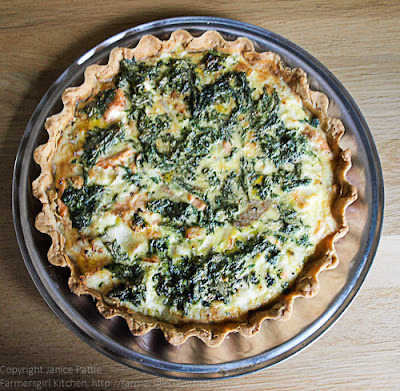 A tart we can give to others knowing it will give as much pleasure to them as making it did to us" There is something even more satisfying in making a tart that includes foraged ingredients such as wild garlic and nettles, free food! Look at this lovely tweet I got from himself! 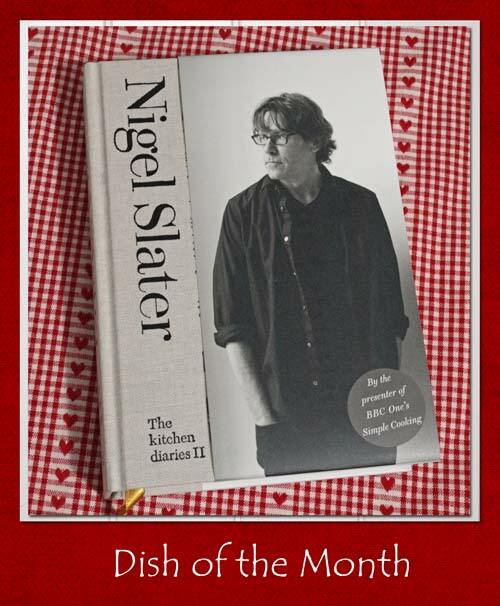 He is very generous with his tweets to Dish of the Month participants. Thanks Nigel, you made my day. When I went to the freezer, I discovered I only had one salmon fillet left, so used a couple of haddock fillets to bulk out the tart, you would never have been able to tell. I topped it with some of the Wild Garlic butter I made and froze last month. 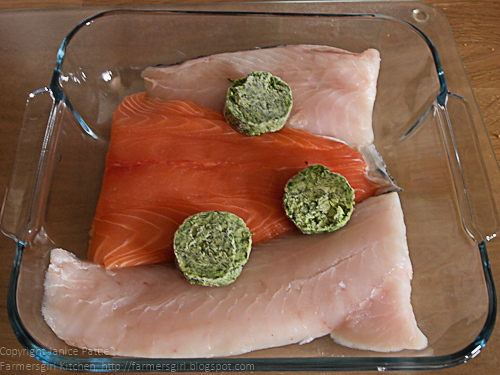 I baked the fish in the oven for about 15 minutes and then left it to cool. 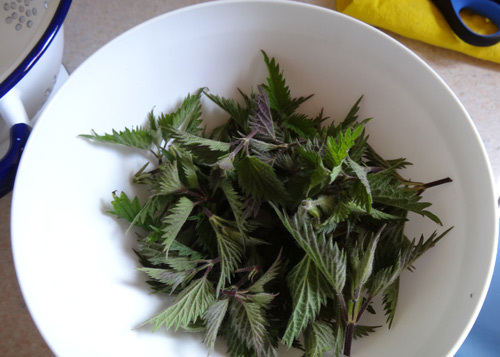 I'd read in The Foragers Kitchen that you could substitute young nettle tops for spinach, so I donned my rubber gloves and headed round into the back garden to collect some nettles. Living on a farm means that the fields and hedgerows tend to invade the garden and while this is not great for gardening, it is rather handy for foraging! I made my usual shortcrust pastry recipe chilled it then baked it blind. 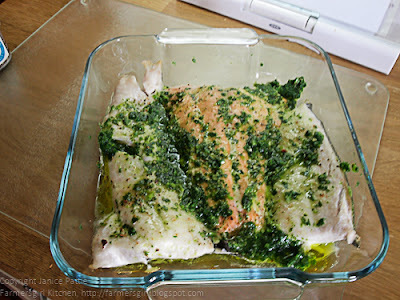 I then added the cooled fish and blanched nettles. I used 3 eggs, one egg yolk and 300ml of double cream for the custard (Nigel uses 4 eggs and more cream) and then baked the tart for about 25 minutes until the custard had set and was turning golden brown. 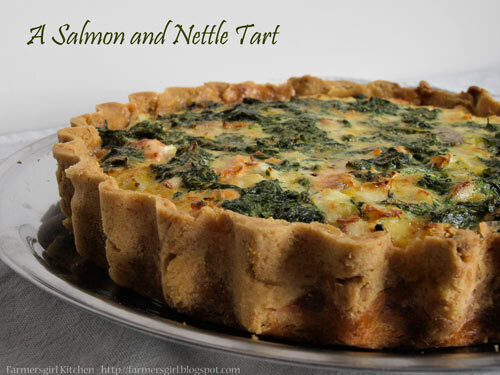 I didn't tell anyone about the nettles until they had oohed and ahhed and told me how delicious this tart was. My mother-in-law surprised me by telling me that she and her step-mother had once gathered nettles and made a nettle broth which she remembered was delicious. My husband also proclaimed that the tart was even better when we had it cold the next day. 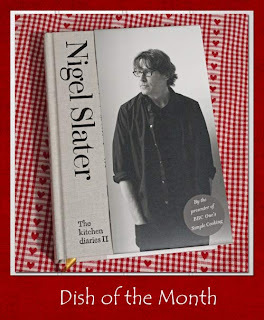 Another success from Nigel Slater's The kitchen diaries II and my entry for Dish of the Month. If you use twitter, tweet your post with @serialcrafter or @Heavenona_plate and #DishoftheMonth and we will re-tweet it to our followers. A lovely looking tart. I love the nettle idea. If I remember right, you should pick the nettles before 11 o'clock. I can't remember "why", though, anymore. This looks and sounds utterly gorgeous! I could go a big slice of that just now (and not because I'm absolutely starving because the OH misjudged the dinner cooking times and dinner is going to be mega late!). Janice this looks wonderful! I've never eaten nettle before. I love the idea of foraging for my own bits and pieces from the garden though. 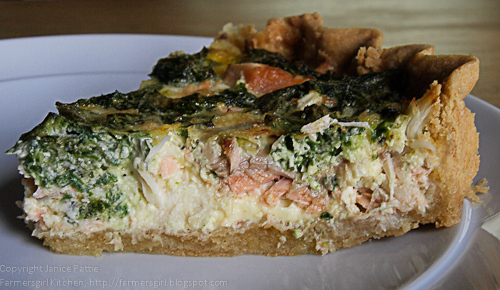 I've picked many wild herbs, berries and crab apples :) Thanks for sharing this gorgeous quiche. Your pastry looks divine. You've done Nigel proud!! 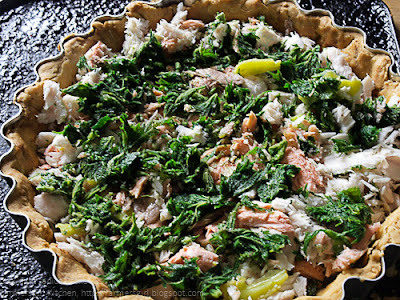 Beautiful photos, and I love a lot the idea of nettle in a tarte! Great recipe. Fantastic, Janice! I love the combination of flavours.